—From December 2014 affidavit by Allen Reaves, vice president and senior production manager for Mississippi Power. The success of Mississippi Power’s Kemper Plant rests in part on the assumption that there will be one or more buyers for some 3 million tons of CO2 generated each year as a byproduct of the plant’s revolutionary coal gasification process. Now that assumption appears imperiled, and with it the fate of the troubled $6.2 billion power plant. A Watchdog.org review of public filings and court records suggests the two oil-drilling companies are no longer contractually bound to purchase the CO2. Just as troublesome, Denbury Onshore and Treetop Services LLC may no longer have the financial resources to use – much less purchase – the tremendous amounts of CO2 the Kemper contracts require them to buy. Campbell, who also noted the confidential terms of the company’s contract, did not answer a question regarding Denbury’s willingness to amend its contract with Mississippi Power, such as to reduce the amount it will commit to purchase. Treetop Services representatives did not reply to Watchdog.org’s questions. A confluence of two unrelated events is at the heart of this latest threat to the snake-bit Kemper project. Oil drillers pump CO2 – odorless, colorless gas – into otherwise dormant fields to force hard-to-reach oil to the surface. The success of such techniques has led to a worldwide boom in oil production – and a precipitous drop in oil prices. The drilling activities of such firms, and so their need for CO2, have diminished substantially since 2011, when the price of oil was high – and when Denbury and Treetop signed CO2 purchasing agreements with Mississippi Power. The second event – well known to all who’ve followed the Kemper saga – involves the lengthy delay in completion of the plant. The Kemper plant was supposed to cost $2.4 billion and begin producing power and capturing CO2 by May 2014. The projected final cost is now up to $6.2 billion and the projected completion date is some point in the first half of 2016. The contracts with Denbury Onshore and Treetop Services contained provisions that protected Mississippi Power in the event that either refused to accept its allotment of CO2. But the contracts also contained termination clauses – deadlines after which the parties could cancel the arrangements without penalty if the Kemper Plant was not yet complete. In its recent financial disclosures with the Securities Exchange Commission, including a filing in late April, Mississippi Power warned that delays in completion of the plant had imperiled three key contracts. The company noted that the cancellation of either of those deals could have serious consequences for the financial viability of the project. One was with South Mississippi Electric Association, a cooperative of local power providers throughout Mississippi. SMEPA, as its also known, had agreed to pay $600 million to become a 15 percent owner of the plant. On May 20, Mississippi Power’s fears were realized when SMEPA cited Kemper’s delays and increased costs in announcing its decision to withdraw from its planned part ownership of the plant. To add insult to injury, Mississippi Power must refund the $332 million it received from SMEPA as a down payment. The repurcussions were swift. Two days later, Fitch Ratings warned that the SMEPA decision, following other Kemper-related uncertainties, would likely lead to a downgrading of Mississippi Power’s credit rating. Fitch’s warning became reality this week, when the credit rating firm downgraded Mississippi Power’s credit rating from A- to BBB+. The firm indicated another downgrade could come later this year. SMEPA’s decision prompted Watchdog.org to review the other two imperiled contracts cited in Mississippi Power’s disclosures. The filings reported that if Mississippi Power wasn’t delivering Kemper’s CO2 to Denbury and Treetop by May 11, 2015, the companies could exit the deals, with no recourse available to the power company. May 11 came and went, and without Mississippi Power having delivered any the CO2. Kemper was never going to be an ordinary coal-fired power plant, turning coal into power. Rather, it’s designed to use a highly technical, largely untested multi-step process that starts with converting low-grade lignite coal into a natural gas-like substance called synthesis gas. That gas will then be used to power the plant, and produce electricity. This highly technical “gasification” process also involves capturing carbon dioxide and other byproducts for sale to industrial users. Sales of the byproducts are to serve as one of the plant’s revenue centers. But the chief purpose of gasification is that it provides a means for power companies to use coal in a manner that produces fewer emissions than normal coal-fired plants. If it works, it satisfies increasingly stringent federal environmental standards. The Kemper plant must capture at least 65 percent of the CO2 produced during the gasification process in order to qualify for IRS tax credits worth $279 million. CO2 capture is also a requirement of the project’s required air permit. Kemper County, in east Mississippi, was selected in part because of the region’s abundant supply of lignite. The plant was built near the lignite mining operation that is supposed to supply it. Kemper County has something else going for it. Mississippi, as well as Louisiana, are hot spots for the type of oil extraction method that uses CO2. 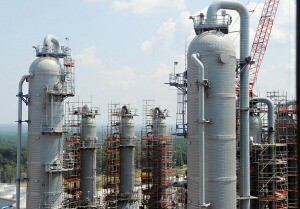 Mississippi Power projects the plant will generate some three million tons of CO2 per year. According to a company fact sheet, sales of CO2 and other byproducts are expected to produce $50 million to $100 million a year, and will be used to defray costs otherwise carried by ratepayers. But the sales of CO2 – and as such, the contracts with Denbury and Treetop – are important for reasons other than revenue production. The operation of the Kemper Plant relies on end users for the CO2. After all, it has to go somewhere. For these reasons, two announcements in March 2011 were important milestones for Kemper. That month, Denbury Onshore – a Mississippi-based subsidiary of Dallas-based Denbury Resources Inc. – agreed to purchase 70 percent of the CO2 generated by the Kemper Plant. In a separate deal, Treetop Services LLC – a subsidiary of Ridgeland, Miss., based Tellus Operating Group – agreed to purchase the remaining 30 percent. The financial terms of both contracts – including the price of the CO2 – was and remains confidential. Public records show that negotiations with Denbury and Treetop had been going on before 2010, when construction began at Kemper. As a term of the contracts – and for that matter, a cost included in the Kemper Project – Mississippi Power had to build a 61-mile pipeline to deliver the CO2 to Denbury and Treetop. Company disclosures show that the pipeline is nearly complete, at a projected final cost of $109 million. Last year, plaintiffs in a class-action lawsuit against Denbury sought to force Mississippi Power to disclose the complete contracts with Denbury and Treetop. The plaintiffs are more than 100 owners of CO2 mineral rights in the Jackson Dome — believed to be the only significant underground source of pure CO2 east of the Mississippi River. Denbury, the largest player in the enhanced oil recovery in the region, has drilling rights to the Jackson Dome. The royalty owners claim Denbury has valued the carbon dioxide drawn from the Jackson Dome at below-market prices, and by so doing, has underpaid them by more than $5 million. Denbury denies those claims. Mississippi Power’s response to the plaintiffs demand for the two contracts provided perhaps the clearest expression yet of the crucial role of the CO2 contracts in the overall Kemper plan. Mississippi Power argued – successfully – that divulging the pricing and related information would harm its ability to negotiate possible future contracts, and noted that Denbury and Treetop did not know the pricing terms of each other’s contracts. Allan Reeves’s affidavit uses draconian terms to describe what could happen to the Kemper plant if no end users for the produced CO2 are found. To bolster its position that it should not be required to divulge the entire contracts, the company filed an affidavit from Allen Reaves, a Mississippi Power vice president and the company’s senior production manager. Reaves’ statements speak to the vital nature of the CO2 contracts – not merely as income sources for Mississippi Power, but also as a means of disposing of the massive amounts of CO2 to be created when the company’s commences operations. Reaves used pretty draconian terms: The project, he stated, could be “shut down” if there were no end users for the CO2. Reaves also offered reasons why the prices that Denbury and Treetop had agreed to pay Mississippi Power for the Kemper CO2 would not be appropriate for the plaintiffs in determining a fair-market value for the carbon dioxide. He cited the burdens and risks associated with the plant’s need to satisfy conditions of a required air permit in implying that the cost of the Kemper CO2 would be higher than market value. Texas-based Denbury Resources specializes in CO2-based enhanced oil and natural-gas recovery in two regions – the Gulf Coast, primarily Mississippi and Louisiana; and in the Rocky Mountains region. The company’s recent public disclosures reflect that it is currently in no position to commit to use much less purchase 70 percent of the amount of CO2 that’s to be generated from the massive Kemper plant. Because it’s publicly traded, Denbury must disclose financial information in reports to the Securities and Exchange Commission. Its recent SEC reports make for grim reading, and for one reason: the dramatic drop in the price of oil. In March 2011, when Denbury and Treetop agreed to buy CO2 from Kemper, oil was trading in the $125 per barrel range. The price collapsed to $45 per barrel earlier this year. It’s since rebounded to about $60 per barrel. Government forecasts call for average prices of about $61 this year and $67 in 2016 – both below the levels Denbury says it needs in order to operate profitably. The company warned it could even have trouble meetings its debt obligations. Denbury also reported that the precipitous drop in oil prices has forced it to sharply curb its drilling activities. In March 2011, when it entered the contract with Mississippi Power, Shares of Denbury Resources were trading in the $25 range. Its shares are now trading in the $7 range. In 2012, Denbury spent $238.6 million on CO2. In 2013, it spent $163.7 million. Last year, the company spent just $56.4 million on CO2. In its April 30, 10K report to the SEC, covering the first quarter of 2015, Denbury estimated that it will spend $30 million on CO2 in the entirety of this year. That’s about an eighth of the amount it spent in 2012. Given these circumstances, it seems unfathomable that Denbury would choose to continue a contract compelling it to purchase substantial amounts of CO2. This is especially considering that the company has other sources that are apparently cheaper than the Kemper product would be, and that it is seemingly no longer bound to buy CO2 from Mississippi Power. Contact Eddie Curran at eddcurran@aol.com.